Yin is for good, Yang is for evil. Yin is an energy from heaven, Yang is an energy from earth. So many translations, different meanings, and even books were written to explain what symbol really means, and guess what! all the translations are right, the Yin and Yang symbol really means everything, it just does! When we meditate on that symbol, watch carefully, we realize that it represents our state on earth, it teaches us the true meaning of being in balance within ourselves, and with every thing around us. You may have seen the symbol many times before, in the Korean flag, in Kung-fu Panda, Karate movies, and in many pictures on the internet, but today we look at the Yin and Yang symbol differently, as we move on with this post, many profound translation will be revealed. Find the white in every black, and avoid the black in every white. One of the first lessons that i received from this symbol! what if we live by this rule? Seeing the white in every black, and avoiding the black in every white, life gets smoother and smoother as we do this, we feel this joy of our existence on earth, we simply grow, and expand. Whenever we see anything that seems perfect, instead of enjoying how perfect this thing is, the human mind, tends to look for deformations "No! this cant be right! ", Or "Ok fine! Where is the catch! "; By doing this we tend to see the black in every white, but once this rule is applied, we will start celebrating how perfect things are, instead of wasting time & energy on figuring out where the catch is. The way we perceive evil things, creates more evil things in the universe, believe it or now, if you declare war against terrorism, crime, drug addiction, HIV...etc you simply become part of all this, you become part of this negativity because you empower the idea that those things exist. It is time for humanity to see the white in every black, and move from there! A good example would be to have a strong belief in peace during the times of war, or to maintain you inner peace during the times of stress. When both rules are applied you simply win the game called life on earth. We are born with duality. If God is pure white light, we add the black half of the symbol to the equation once we are born. And the black half here is called duality. Do you treat people equally? Do you tend to help those who have the same religion as yours more than others? Do you support a football team in a way that makes you hate other teams? Do you to a political party, and hate your competitors, and always feel that they are wrong, and that nothing is right but the ideas and the thoughts your party presents? This is pure duality! and moving form there, you start to accept for others what you do not accept for yourself, which empowers the black over the white. To get rid of duality, i got rid of all my political beliefs, of how i see others, of even how i see enemies, and replaced all this by love. It takes a decision to get out of the box, raise above duality, and start listening to everyone with passion! treat everyone equally with love & respect. The symbol represents life on earth. 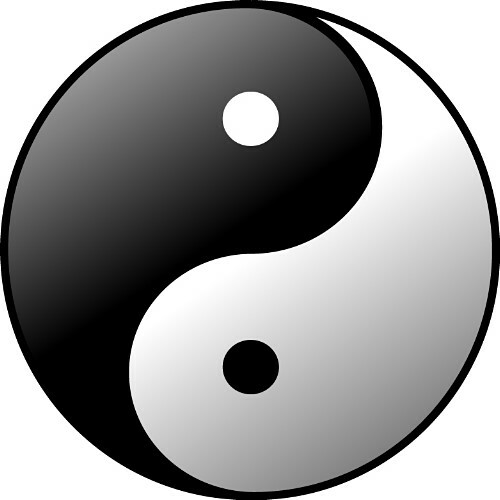 To live happily on earth one needs balance, and the yin and yang symbol represents this balance we need in our life. you cannot be too grounded, and you cant float all the time! To enjoy living on earth one needs to be centered, through a balance of yin and yang energy within the energy body. This balance once achieved, we satisfy our earthy needs, and in the same time we stay connected to source, and this results in real happiness. The balance can be achieved through a combination of meditation & sport, yoga, or any other form of spiritual activity mixed with a physical one, you choose what suits you best. In fact you will know what it takes to achieve this balance if you listen to your body, and address its needs. The symbol represents the holy books. Many people lose their faith because they can't take the idea that God is very loving, but very cruel, God rewards, but can punish, God is love, but can hate those who do not follow his orders, and this is not true. God is love, and nothing but unconditional love! If you look deeper into holy books, you will see the symbol clearly, you will see a dark side, and a white side, and we simply choose which side we tend to vibrate to. If we are positive we automatically see the white side and vibrate to it, even what we call mistakes, becomes different, we start to look at mistakes as experiences we are meant to go through, not as bad things that will send us straight to hell. Negative people will tend to see and vibrate to the black side, and they will do this in life too, not just when reading a holy book. The message of god is clear "I am the source of love and light, and you are part of me. If you ignore the bigger part of you, and rely on your tiny physical mind, you then choose to see the dark side in everything, it is your choice, and you are the one hurting yourself. Good comes from God, Bad comes from the human mind". I encourage you to have a mental picture of the symbol in your mind, and then write down what you learn. Am positive that there are a lot of things to learn from that symbol, and because everyone is different, everyone will have a a very unique experience with the yin and yang sacred symbol. Thank You!